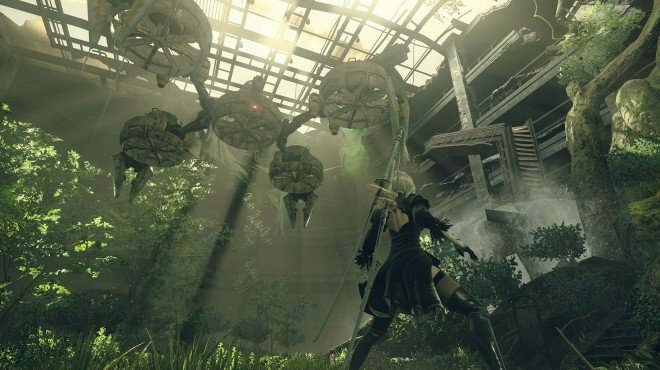 Tower Infiltration is a Main Story Quest in NieR: Automata. "All the keys have been obtained, and 9S can enter the mysterious tower that emerged from underground." Unlock the Tower with the keys. This quest becomes available after Obtain Keys has been completed. 9S will awaken at the Amusement Park. Travel to the City Ruins, and go to the tower. Use the keys at each sub-tower, then hack into them to access the central one. Once you begin hacking the main tower, enemies will appear. Fight them off until Devola and Popola arrive. Afterwards, defeat the enemies in front of you and continue with your hack. Once you are inside, you can chose to see the Devola and Popola records to earn the trophy "Crime and Punishment"
Afterwards, continue forward with your investigation. You will find a Locked Chest with Archives: Project Gestalt Report 9. Continue forward until you come to a room where several YoRHa 2B models will attack you. They are fast so dodge often. Once you have defeated them all, approach the corspes for a cutscene. The control changes to 2A. Go to the tower and talk to Devola and Popola after defeating the Goliath Biped enemies at the entrance. Head inside and follow the path 9S took. Continue onwards and when you try to go through the hole in the wall, two girls will interrupt you and bring forth machines to fight. You can knock some of the machines off the ledge, making the fight faster. This unlocks Archives: [Top Secret] YoRHa Disposal. On the next room, a tough encounter with several flight unit YoRHa ensues. Use your pod's charged attack and evasion in between hacks. During the fight against the three waves of machines that appears after the two girls interrupt you, there is some air imploding/exploding attacks that come out of nowhere. Anyone know what I&apos;m talking about who knows what that is and how to dodge it on Very Hard? Because sometimes the attack just starts where you&apos;re standing and you die instantly without any way to react.